Hi everyone! 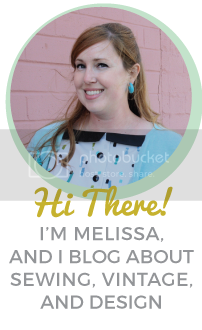 Welcome to this week’s Thrifty Thursday post, where I share my thrift store (or sometimes estate sale, flea market, or yard sale) finds for the week. This week was a fruitful one on the thrifting front, which is great because as I mentioned last week, we now have two antique spaces to fill! Phillip and I are both really curious to find out how our new space is doing but we probably won’t be able to get down there for another week or so because I’ll be selling at the Halcyon Store Spring Craft Fair this weekend (more on that soon)! 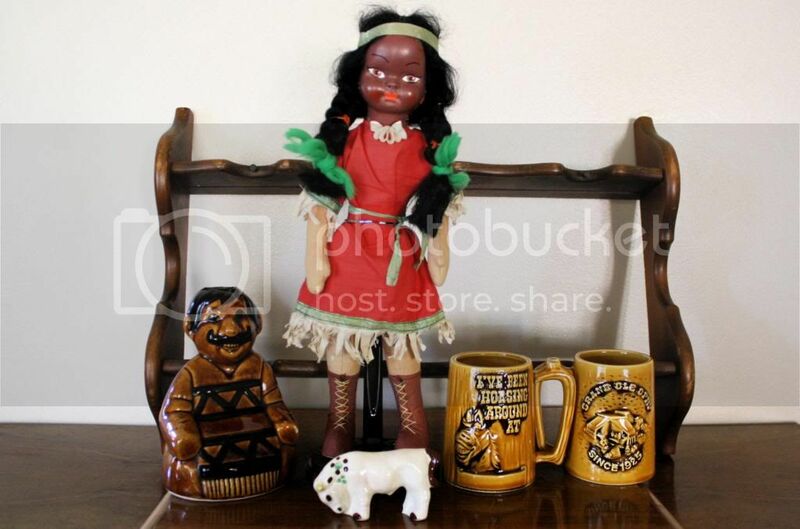 From Left: a Trader Vics decanter (unfortunately missing the top), a vintage Indian girl doll (I’m not sure of the era), a little porcelain bull, a pair of Grand Ole Opry mugs, and in the back, a shelf for hanging tea cups and saucers. I was especially excited about the indian girl because she reminds me of some dolls I had as a child (I went through a phase of being completely fascinated with Native Americans). She’s a keeper, at least for now! 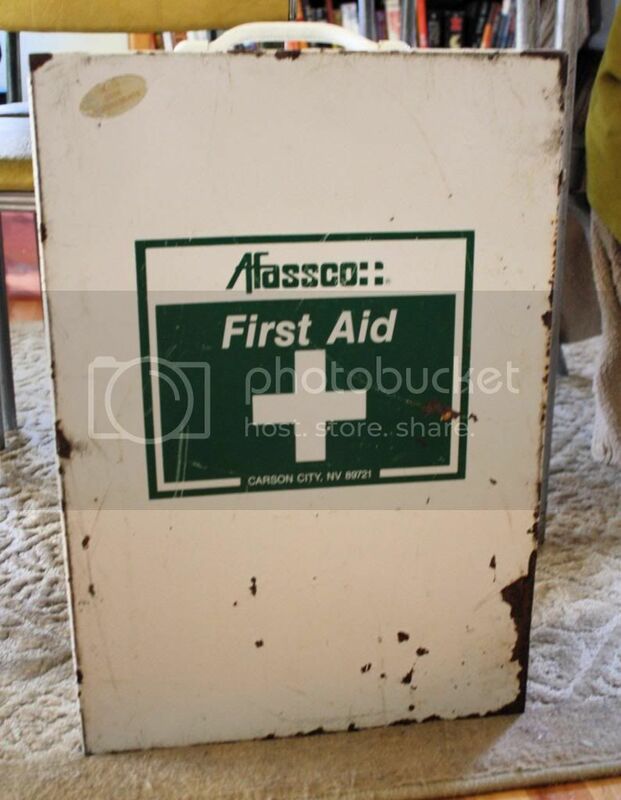 Phillip picked up this vintage first aid box for $3. We’ll be putting it in the antique space. Phillip was super excited to find this Monster Mash record at a local thrift shop. Apparently he had almost bought one on Ebay a few months back, only to drop out after the bidding had climbed upwards of $50. And then he found one for less than $1! Funny how things work out like that. 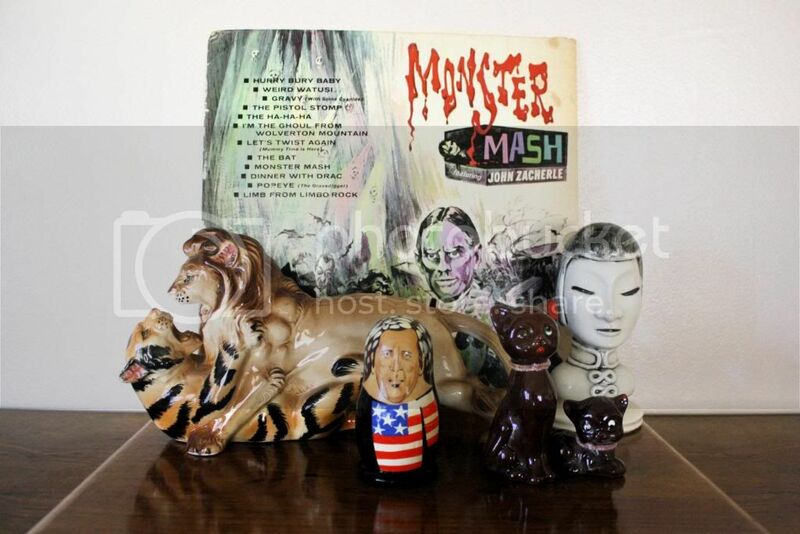 He also found this lion and tiger statute, the political nesting dolls, the little ceramic cats, and this funky Asian head. 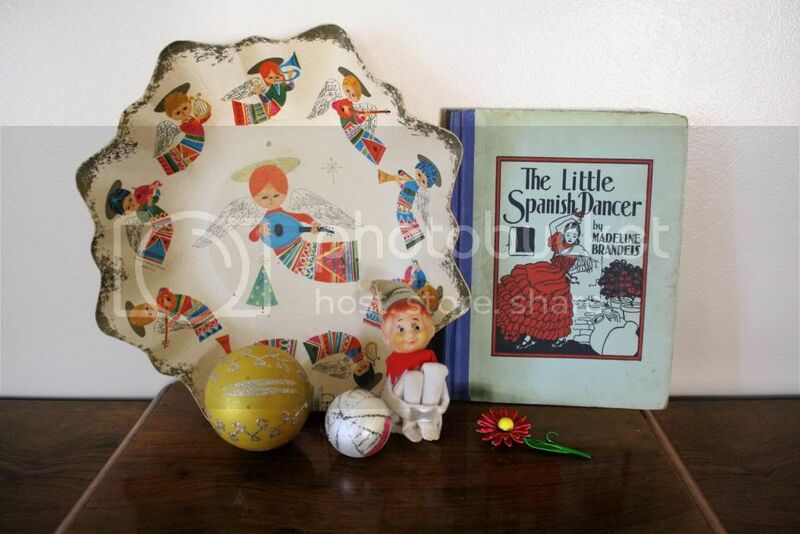 We found a few Christmas items this week: a pretty paper bowl with angels, a couple of glass ball ornaments, and a little elf man. We also picked up this cute book from the 1930s “The Little Spanish Dancer,” and this enamel flower pin. 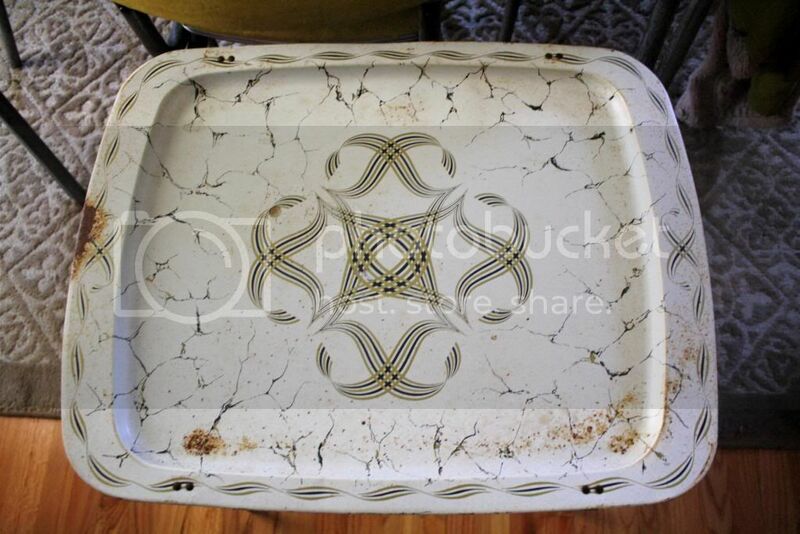 Phillip found this TV tray for $1.50. 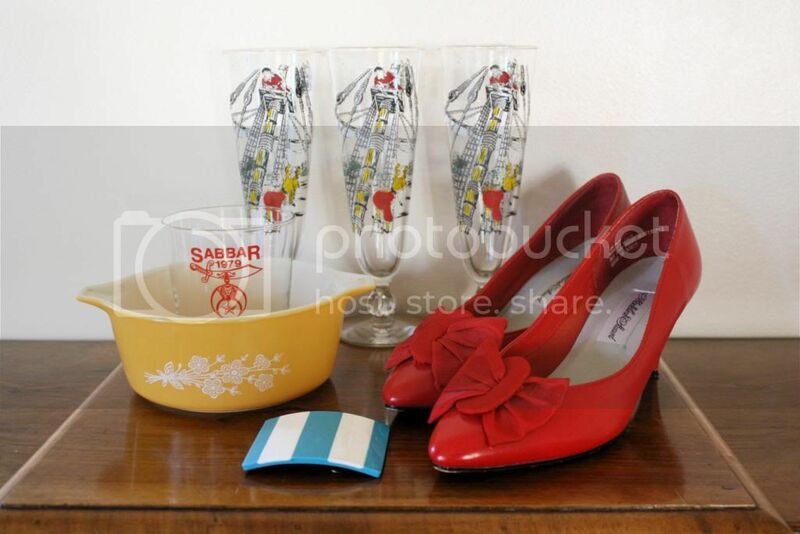 I found this cute yellow Pyrex, a striped belt buckle for my new sewing section in the antique space, and a pair of adorable red shoes (which I wish fit me, but alas I have huge feet). Phillip found the glassware: a set of pirate drink glasses and some from a Masonic lodge. 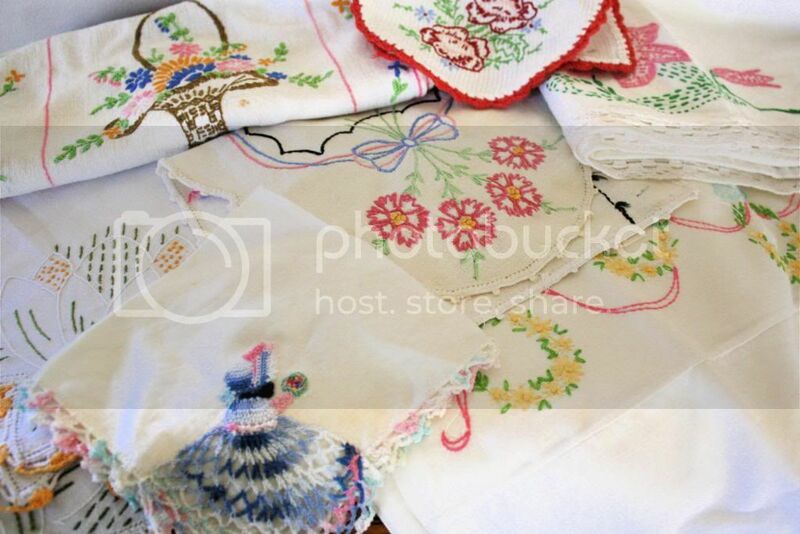 I hit the jackpot with all of these pretty embroidered linens at rock-bottom prices (most were 65 cents). They’re headed for the space to add some prettiness! 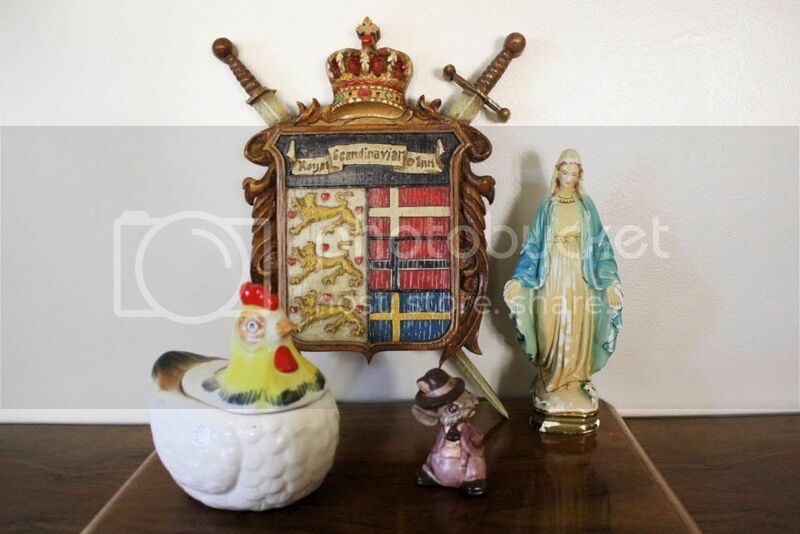 Lastly, we found a couple of plaques from a local hotel, the Royal Scandanavian in Solvang, CA. We love finding fun little pieces of local history! We found a very chipped but still pretty chalkware Virgin Mary statue, a little mouse in a hat, and this hen box. Did anyone else go thrifting this week? What did you find? I’ll be linking up at Apron Thrift Girl, A Living Space, Sir Thrift A Lot, Joyful Treasure Hunting, and Young Heart. Head on over and check out all of the finds for this week! 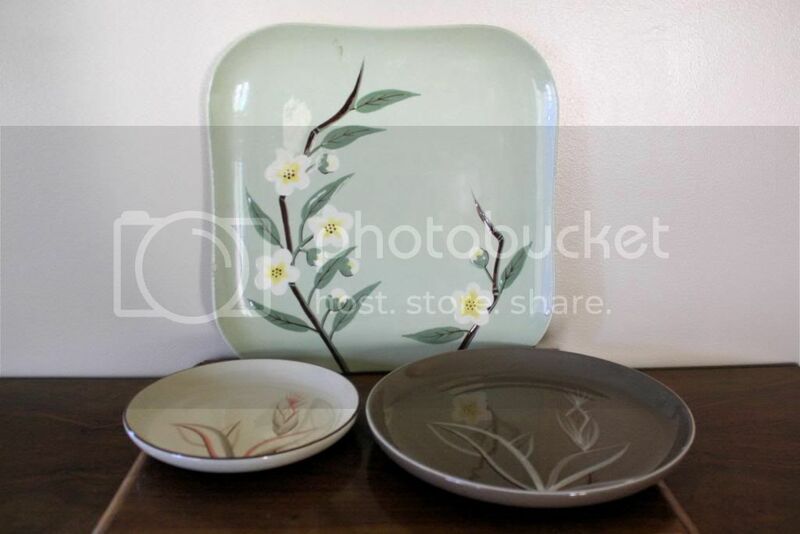 If you see any items you like, they may be listed on Phillip’s Ebay account, so take a looksie!